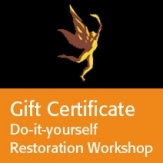 Much has been written about the art of restoration. It is usually referred to as the non-institutional knowledge passed from master craftsman to apprentice, father to son, or artist to pupil. This is the main difference between restoration and conservation. Both restoration and conservation aim to preserve the cultural heritage by following a set of rules anchored in a code of ethics. They might use the same methods to complete missing or broken pieces of an artifact, but the restorer will make the restoration fix inconspicuous while the conservator might do just the opposite – make the fix prominent. The use of reversible materials is one of the basic working guidelines that are common to both restoration and conservation. Restorers as well as fields of restoration are usually grouped by materials (leather, glass, wood, metal among others) or artifacts (paintings, objects or ceramics for instance). My point of reference here is of course antique wood and furniture restoration and the application of traditional restoration techniques and materials. 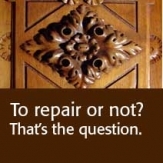 In this context, one might ask: Does restoration increase the value of an object or diminish it? That depends. First – is the persona carrying out the restoration a certified restorer? Is the restorer keeping the intervention to a minimum so the restored object doesn’t look like it just came from the shop? Over-zealous intervention in the course of restoration can actually diminish the value of high quality antique furniture to as little as one-tenth of its market value. To the unprofessional eye the object might look good, but the truth lies in the details: use of the correct reversible materials; intrusive interventional methods kept to a minimum; careful documentation of the research and the work process before, during and after the restoration; and recommendations for maintaining the finished piece of antique furniture or any other wooden object or artifact that has undergone restoration. 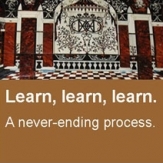 Consider, for example, the challenges presented by a typical restoration project. The veneer of an 18th Century chest might have been 3 mm thick when produced because of limitations in technology (today veneer is processed to a thickness of 0.6 mm). If this piece of antique furniture has been in use for the past 200 years and refinished several times by restorers, the veneer may have lost more than half its thickness, and in some areas be worn away completely, exposing the underlying wood. A professional restorer will minimally intervene in such a project and preserve the existing finish rather than create a new one in the restoration process. This process may risk the loss of the remaining veneer if done in an intrusive way.